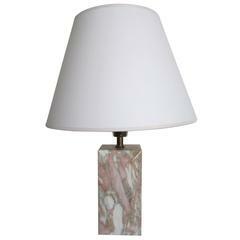 Contemporary handcrafted, sculptural table lamp, model "Hespera" in solid marble, in a geometric form. Brass base on the back side. The light source consists of LED strip on the back side of the sculptural lighting. "Hespera" is part of the "Lychnos Series", a collection of three sculptural table lamps in solid marble, in geometric forms. Variations are available in custom size and type of marble, upon request. Designed and handcrafted in Athens, Greece. Variations are available in custom type of marble, upon request. ANAKTAE is a design studio established in 2009 by industrial designer Dianna Karvounis and architect Vivian Philippa. Combining archaic harmony with Modernism, the studio embraces diverse scales of creativity: Furniture, Lighting, Objects as well as Architecture and Interior Design, showcasing authentic luxury and timeless elegance. All their work has a distinct aesthetic that could be defined as neo-archaic. Inspired by ancient symbols and geometries, they create archetypal forms whose dynamism derives from their innate harmony. Rooted in a deep appreciation of craftsmanship, every piece is hand-made to order from natural materials such as bronze, marble and wood. Striking a balance between austerity and sensuality, these objects convey their own enigmatic but unmistakable atmosphere. 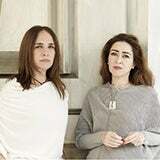 Based in Athens, Greece, their work is in private collections, cultural foundations, museums, and galleries worldwide.